Nottinghamshire history > Articles > Articles form the Transactions of the Thoroton Society > The Church of St. Leonard, Wollaton. The Church of St. Leonard, Wollaton. A study in medieval mason-craft. No. 3. St. Leonard's church, Wollaton (photo: A. Nicholson, 2007). THE statement that in order to acquire the fullest knowledge and understanding of a village church it is necessary to study it in conjunction with other contemporary buildings is particularly pertinent here. This church is attractive by reason of its picturesque setting, and renowned for the memorials it contains relating to the stately Elizabethan House of Wollaton; while if it were not so hidden or mutilated by the monuments and later additions, its architecture would be of paramount interest. A casual observer would never think that this chancel had affinity with the neighbouring churches of Barton-in-Fabis and Wilford in this county—much less with Tideswell in the neighbouring county of Derby: the prototype of the later phase of a series of chancels built by a famous school of craftsmen. The relationship is still manifest however, to the student of mediaeval mason-craft who has been diligent in making comparisons. The refined section of the mouldings, the predominance of graceful ogee curves in the tracery, and the slender octagonal pendant corbels so freely made use of, are features which cannot fail to claim attention; while contiguity to the quarries on Trowell Moor perhaps first drew the attention of the craftsmen to the qualities of coal-measures sandstone used in this and succeeding works. A brief historical survey of events which led up to the re-building of the church in the 14th century may help to elucidation. Before the Conquest, Wollaton was "the homestead of Wulflaf." Through corruption of speech "Wullave(s)ton" became first Olaveston, and eventually Wollaton. After the Conquest, Peveril held it of the King, his "man in possession" being Robert, the son of Warner in Toton. We hear little of him for he was soon succeeded (in the reign of Henry I.) by Robert de Mortein, who came from the Department of La Manche in Normandy— a man of ancestry and position, as we may judge from his shield. OR. fretty AZURE. (See plate II. Fig. 6). When his over-lord, William Peveril, founded the great monastery at Lenton (c. 1103-1108), Robert de Mortein became a Benefactor,1 and from that time onward the Mortein's and their successors the Willoughby's, upheld the connection. It is a fair assumption that Wollaton was served by the parish church of Sutton Passeys, until some time after Lenton Priory was founded. Reference is made to presentations to the Rectory of Wollaton as early as 1237, but Domesday Book, and the Taxation Roll of Pope Nicholas IV. (1290) are alike silent with regard to church or priest at Wollaton. It may be only coincidence, but it is not without interest to note that Wollaton Church is dedicated to St. Leonard, and according to Thoroton the death of an early patron occurred on St. Leonard's Day. (William de Mortein died 6th November, in the twelfth year of Edward I., 1284). St. Leonard the Hermit, friend of prisoners and captives, was held in much honour in England at that time, and seeing that this church from its very inception was dedicated to St. Leonard, it may be that it was erected in memoriam soon after the death of William de Mortein. What this early church was like must be left to conjecture, for not a fragment of it can now be identified. In the eleventh year of Edward II., Richard Willoughby, of Willoughby-on-the-Wolds, purchased a portion of the Wollaton estate from Roger de Mortein,2 and thus the connection between Willoughby and Wollaton began. It was made absolute shortly afterwards when Richard's son, the eminent Judge, married Isabel, daughter and heiress of Roger de Mortein, and Willoughby and Wollaton have since been inseparable. 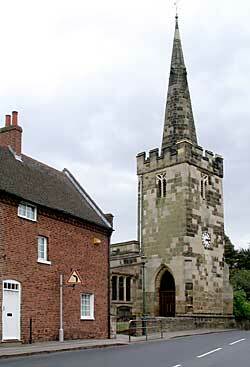 When the Willoughbys first came to Wollaton, there was an adjoining village towards the east known as Sutton Passeys. "The site of this place, nor that of its church, cannot now be traced." (Throsby). It was allowed to fall into decay, probably during the visitation of the plague in 1349, and the site is now enclosed somewhere within Wollaton Park. In the church of Sutton Passeys a chantry of Our Lady was founded by John le Colyer. This chantry was removed to Wollaton Church by grant in 1360, and all the circumstances point to this as the incentive for building a new church at Wollaton. We know that Hugo de Willoughby, son of Richard, was Rector of Wollaton, 1361-1375. The license for removal was first granted to Richard Willoughby in 1340, but it was not until after the death of the original founder that a new charter was granted3 and confirmed. 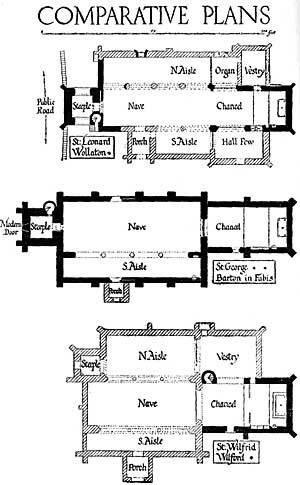 "The chantry, at the demolishing of the chapel, was translated into the church of Wollaton and called Sutton Passeys chantry" (Torre). The prior and convent of Lenton to have presentation after the death of the founder. The eastern half of the chancel at Wollaton, with a portion of the sedilia, the priest's doorway (re-set); the steeple and one bay of the nave at the west end are parts of the re-building scheme. The diagonal angular buttresses, the profile of the mouldings, and the tracery of the square-headed windows follow the style in vogue during the latter part of the 14th century, but the grace and beauty of much of the work are now so marred by more recent alterations and additions, that a word of warning is needed. (1) Robert de Mortein and his heirs gave a yearly rent of 10/- for ever in lieu of portion of his demesne of Wollaton and Cossall Eustachius de Mortein (and Adam his brother) confirmed the gift of his grandfather, Robert de Mortein, and his father Adam, 10/- at Pentecost or within the Octave, and 6/- within the Octave of St. Martin and gave Henry, son of William Hamelyn, of Wollaton, his villein, with all his sequel and Cattel to Lenton. (Wollaton MS.). (2) November 4th. Edward II., 1314. Letters patent of Edward II. granting license for Roger de Mortein to assign to Richard de Wylgheby, senior, 80 acres of wood in Wolaton, and the advowson of the churches of Wolaton and Cosshale, held by him of the King in capite of the honour of Peverel. (Wollaton MS., p. 87).